With about two weeks left until what may be the final deadline for a new NAFTA this year, Mexico and Canada are signaling there's a deal to be had — if President Donald Trump wants one. U.S. Treasury Secretary Steven Mnuchin, speaking in an interview on Fox News Sunday, said Trump's priority is getting a good deal, even if it means disregarding "any deadlines" to let current lawmakers approve it. That would leave a vote to the next Congress, which Trump's Republican Party may no longer control after November's midterm elections. Mnuchin told CNBC on Monday the administration would even be open to a so-called "skinny deal" for NAFTA, which would entail making less significant changes to the pact that wouldn't require congressional approval. But that's not the White House's current objective, he said. "For right now, we're focused on a new NAFTA that would go through Congress," he said. With a possible U.S.-China trade war "on hold" after negotiations last week, according to Mnuchin on Sunday, Trump's administration has more bandwidth to pivot back to NAFTA. The question is whether all sides are willing to give the "flexibility" that Mexico's chief negotiator said on Saturday is needed to reach agreement on the toughest issues. "There's always a chance," Bruce Heyman, a former U.S. ambassador to Canada under Barack Obama, told BNN Bloomberg TV on Friday, saying the "last leg" of trade talks is always tough. "I think the real question that has to be asked is: Does the U.S. administration want a deal or not? I think there's a push-pull going on with Republicans." Talks have lately focused on the auto sector. The U.S. wants to rewrite rules so that a greater portion of a car is built in North America, and in the U.S. specifically. The U.S. has watered down some of its proposals, and Canada's envoy to Washington has indicated the sides are very close to an agreement, but the U.S. and Mexico are said to be at odds over a provision to require a certain share of the vehicle to be built with higher-wage labor. If an agreement is struck on autos, it's possible the other contentious issues could fall into place and a deal could be reached quickly. If each requires the same attention as the auto file, talks will drag for months or more. Other thorny topics are in agriculture, a U.S. proposal to dismantle Canada's system of quotas and tariffs in its dairy sector, and on U.S. demands for a five-year sunset clause and to kill certain dispute panels -- each of which was cited as a sticking point by Canadian Prime Minister Justin Trudeau last week. Another issue revolves around U.S. demands to curtail the value of U.S. government contracts awarded to Canadian and Mexican companies. Any country can quit the current NAFTA on six months' warning. None has given that notice, though Trump regularly threatens to. 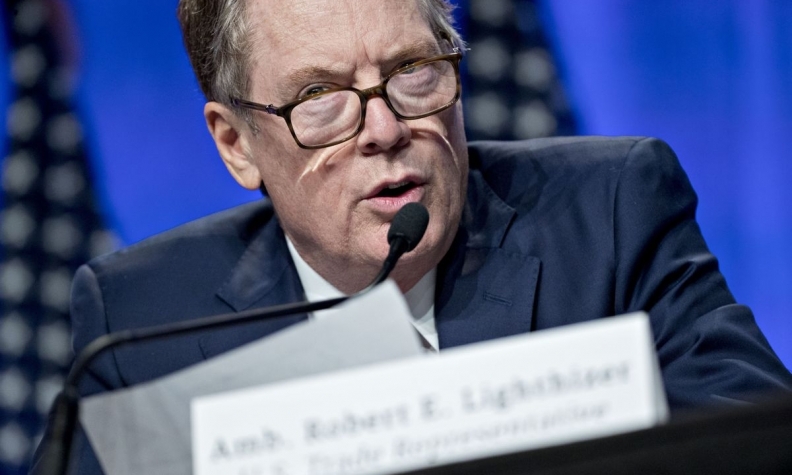 U.S. Trade Representative Robert Lighthizer put a damper on talks by issuing a statement late Thursday saying the countries are nowhere close to a deal. There are "gaping differences" on autos, agriculture, intellectual property and other subjects, he said. "We of course will continue to engage in negotiations," he said. After nine months of talks, the nations remain far apart, Mnuchin said Sunday. "So whether we pass it in this Congress or we pass it in the new Congress, the president is determined that we renegotiate NAFTA," he said. "That's something we're doing." Trudeau said during a U.S. trip last week that there's a deal on the table that meets the U.S. objectives. Lower-level officials are continuing negotiations. It's unclear whether the trio of ministers will also hold a session this week. House Speaker Paul Ryan had said May 17 was the deadline to notify Congress of intent to sign a deal, citing U.S. trade law timelines. He's since extended that time-frame by a week or two, putting the deadline near the end of May. Senate Finance Committee Chairman Orrin Hatch on Monday urged the administration to focus on getting a good deal rather than meeting a specific congressional deadline. "The most important thing for determining when and how Congress will vote on an eventual NAFTA outcome is the quality of the agreement," the Utah Republican said in a statement. Negotiators have so far completed nine of about 30 chapters of a final deal, Mexico's chief NAFTA negotiator Kenneth Smith Ramos said on Twitter Saturday. "The last mile will require flexibility from all 3 Parties in order to find the balances that may allow us to close the negotiation," he wrote.